A travel sized collection of your favourite Caviar members. 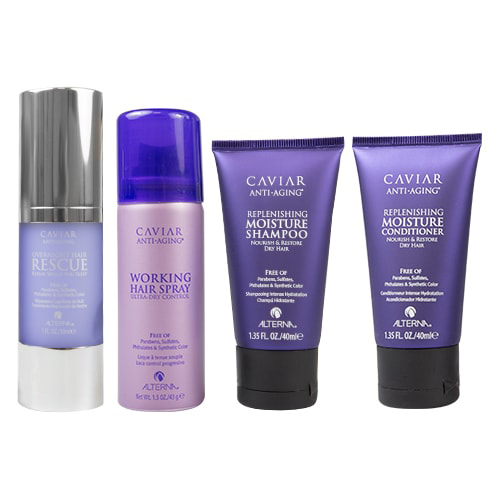 Created to transform the hair's appearance, the Caviar Moisture Transformation Kit offers hair repairing properties as well as adding lift and shine. The four mini trial sized products allow you to get a taste of the moisture imparting experience the Caviar Collection aims to achieve. Seasilk - A cocktail of marine derived botanicals that help to repair hair and deliver moisture. Colour Hold Technology - A colour locking ingredient that keeps hair looking vibrant. Caviar Extract - Smoothes hair to induce a high shine finish. Caviar Moisture Shampoo 40ml - A cleansing shampoo that offers intense hydration and moisture providing properties for a sleek, smooth finish. Caviar Moisture Conditioner 40ml - A creamy conditioning formula which aims to repair breakages and improve the hairs overall health whilst smoothing the cuticle. Caviar Moisture Working Hairspray 43ml - A flexible hold hairspray that offers a long lasting finish to any style. Overnight Hair Rescue 30ml - A hair repairing treatment that offers intense nourishment and incomparable shine.